(15December 2012) This issue will delve into hull shaping. The 1 January issue will remind us about bevels, again. Another beautiful AF4! This one by Kevin Widany. 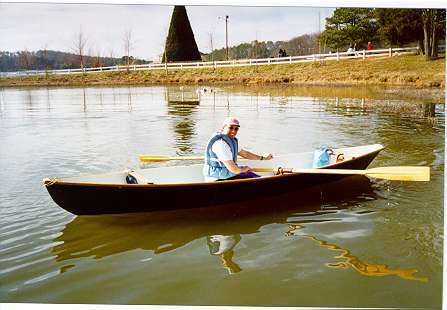 Is there any guidance for shaping a hull for efficiency, especially for the plywood hull? 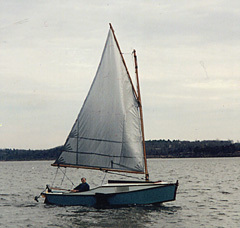 Phil Bolger has hinted in his books of his theories for shaping hulls. About twenty years ago he sent me a copy of his shaping theory in an article which he said had been turned down by the magazines. I'll regugitate what I can remember about it. His idea helps you visualize the water flow. Right away you can see that a long finely shape boat should have less form drag because the angle of that the hull makes with the peas is more shallow than a short blunt boat. No surprize there. And a narrow boat will push the peas with less force than wide boat. So, ignoring the surface area part of the problem, making a boat longer and narrower should make it faster. 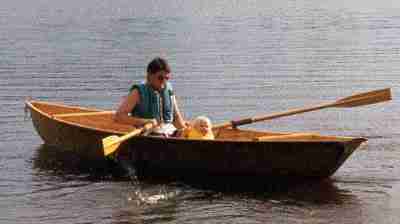 But most boats are limited in some way as far as length goes and with a given weight, the beam and depth follow quickly. Then the problem becomes, "What can I do to shape the hull lines for efficiency with a given weight and waterline length?" I'm reminded of Howard Chapelle's saying, "Water doesn't like to be surprized." So when I lay down a line on a paper I try to keep it as smooth as possible. I've been told Joe Dobler's more advanced designs were all done with sections of circular arcs. I don't do that but try to use a normal untapered spline which deflects through just three points. The resulting curve is not a circular arc since its ends will have no curvature, but it is still very smooth and has the advantage that real full sized wood will want to take the same curve. I'm not sure how Bolger does it. It's the sort of boat that we've looked at all our lives. It has a pointy bow with the stem fairly deep in the water. Bolger would say something like this: The bow sides curve a lot more than the bottom. Therefore the pressure on the sides is greater than the pressure on the bottom. So the water on the sides will try to move from the higher pressure on the sides to the lower pressure on the bottom, eddying around the sharp chine as it goes. The eddies are energy robbers that slow the boat. Starting to look familiar? Here is the Bolger Micro. This particular Mico belongs to John McDaniel. 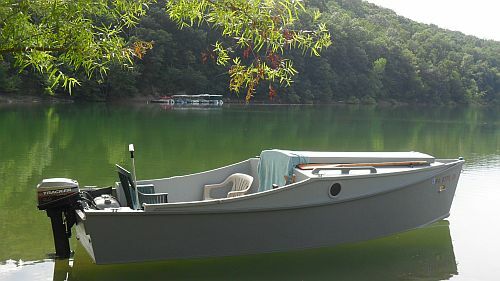 It's one of the finest examples you will find, probably the best built boat I've ever seen. You can see the Bolger theory at work here. The bottom is highly rockered, the bow sweeping very high. The bow is also squared off and would sweep even higher if it were not squared off. But even here the bow is not swept up to the degree of matching the bottom and side curves. Phil also believes that the plumb sides give superior motion over flared sides. All these elements combine to give what we all call the Bolger Box. About now the historians are saying," Hey, he's reinvented the garvey!" They are nearly correct although the Bolger hull would be a bit more slender in the bow. 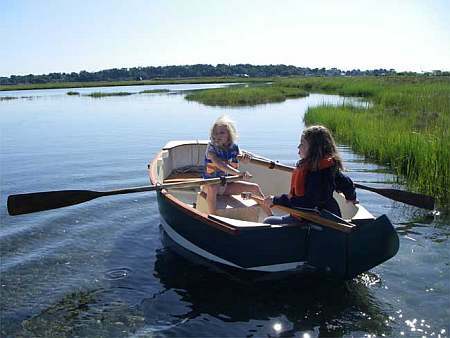 If you look at figure 12 in Chapelle's great book American Small Sailing Craft, you will see that the "Old form of rowing punt, from Chapman, still to be found in America" follows the Bolger idea almost exactly. 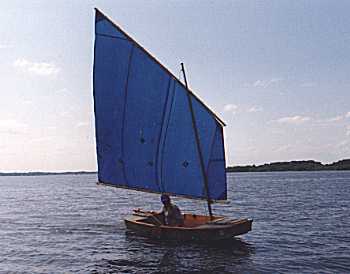 Bolger has always been quick to point out that his highly rockered hulls were faster and noisier than the traditional flatties. I would add that they probably handle better too. I don't know of any real life test that has been done to check the theory, for example using two hard chine boats together that were identical except for the hull shaping. It would be interesting. "But," you ask,"What about waterline length? The big rocker in the bottom of the Bolger box gives away a lot of waterline length and that length determines speed." Good question and I don't know a full answer. One comment would be that the waterline length sometimes determines the top speed of a displacement hull and that your boat usually isn't going that fast. Still that doesn't explain the speed that some of these boats attain. I was on John's Micro in a high wind and we got 8 knots on his knotstick with the stern wave trying to climb on board. 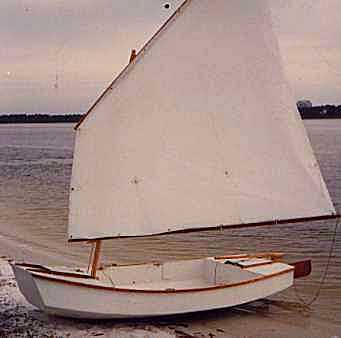 The Micro probably has a waterline length of about 12' and would have a top speed of about 4.5 knots using the traditional formula. And I don't remember feeling it was "planing" either. By the way, you can tell at a glance at the hull lines whether the sides and bottom have equal curves. Look at the lines below. If in the end view the chine line bisects the side/bottom angle then the two panels have equal curvature. The lines above are for Piccup Squared. But I've used the theory quite a bit including Moby, Pencilbox, Cubit and Jewelbox, all shaped exactly to the theory. They are all scow bowed. Karl James' Jewelbox is shown below, it's roomy simple scow hull very apparent and you can see the chines sweeping well above the waterline fore and aft. 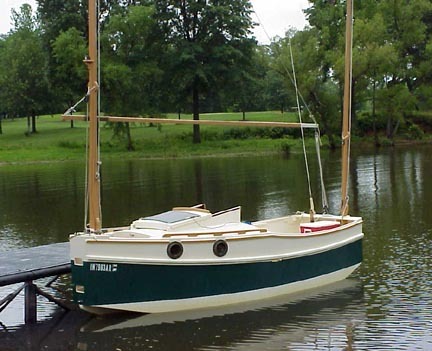 These boats all sail quite well, with the warning that any wide flat bow will bother you in rough water. It's possible that the pointy boats are better then. Nobody likes the looks of these scow boats. Bolger would say something like, "No one wants to face the fact that the performance they like is the result of the looks they don't like. 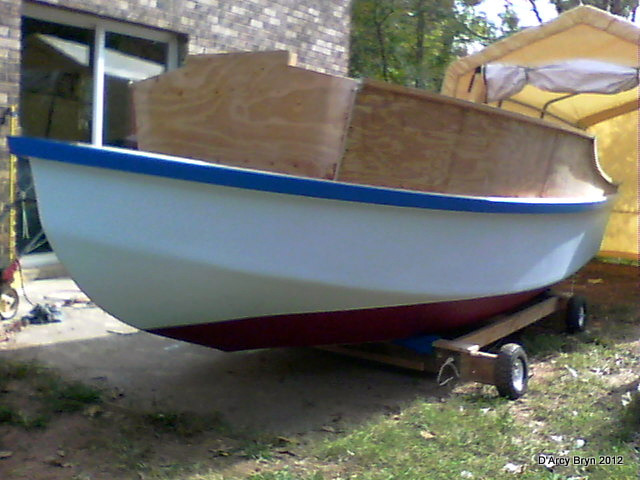 The scow bow is the first thing to go. 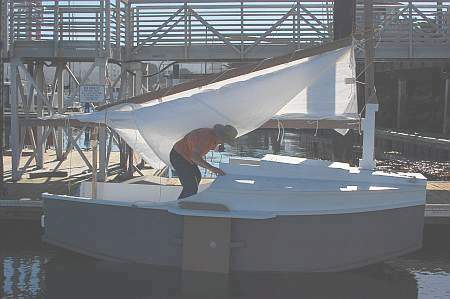 Phil usually leaves a small flat bow transom, but not as wide as it would have if the sides and bottom had the exact same curve. Often the small bow transom gives a little extra room exactly where it is most needed and as with Micro gives a place for boarding steps. Still the bottom is swept high above the waterline at stem and stern. I haven't used the little bow transom. I've either gone full scow bow or full pointy bow. But the idea behind the Bolger theory is kept in mind and the bow is swept up above the water as you see here in the pointy bow AF2. 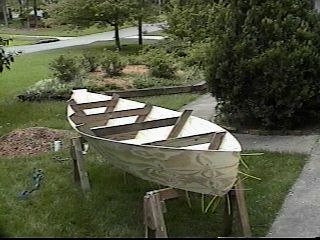 I haven't copied Phil's plumb sides, my boats always have a little bit of flare to the sides. I don't totally follow the idea that plumb sides make for a better boat. Phil would say that plumb sides give the widest possible bottom, but I think the last thing you want is a really wide flat bottom. At least not if you want good overall performance in a variety of conditions. Somewhere else Phil wrote that the general rule for good performance in sharpie hulls has the bottom six times as long as the beam. By modern standards that would be a very long narrow hull. But it doesn't take much flare to ease the looks of a sharpie. Five degrees is enough, that's about what the AF2 has and it looks pretty traditional to me. Also I've always felt that a boat with flare is a little more comfortable and that the extra deck width, as with AF2, provides a bit more righting moment in case of a knockdown. But I suppose the flare is still mostly for looks. 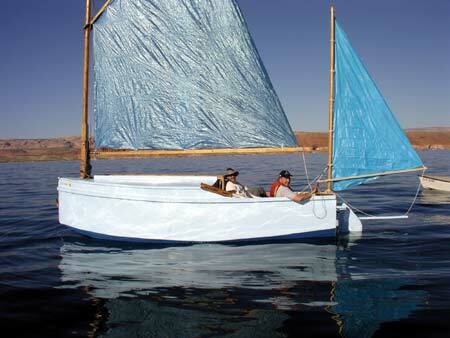 If you use a lot of flare, as with a dory, you will get the situation of a very narrow bottom which won't sail well. Piccup was designed before I knew of the Bolger theory. Still it is a very fast and able boat. I'm thinking when the water crosses a 30 degree angle bilge as with Piccup, the drag effect is nothing compared to crossing a 90 degree angle bilge. In fact a boat like this is very close to a round bottomed hull and has little resistance to side motion.What about that sharp upper chine? It's totally out of the water during normal sailing. It was designed exactly to the Bolger flow theory with side and bottom panels bent to the same curve. 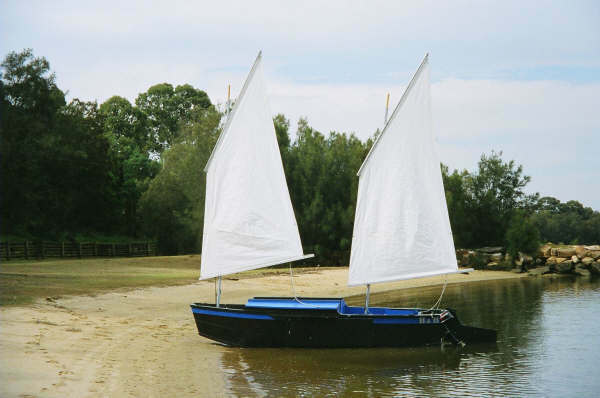 It has the same length, weight, sail rig and overall configuration as Piccup except that it is a hard chined flat bottomed scow where Piccup has the multichines. I always felt that Piccup Squared was as fast as Piccup in smooth water but that Piccup was superior otherwise, especially regarding handling in rough water. There is no doubt that 11 foot flat bottomed scows are not the best in rough water. So Piccup Squared was a real attempt to compare the two types of hull shapes but I was never able to sail the two boats side by side and that might be the only way to test the effect. As for a planing power boat, the shaping gets simplified quite a bit. When planing the bow is well out of the water and could be any shape. In smooth water the best planing surface aft is bound to be very close to a flat plate although some would have a slight reverse hook in the aft bottom to trim the boat. I would think that in smooth water the old simple jonboat shape is the best. Not so in rough water. There I think the V is the best. 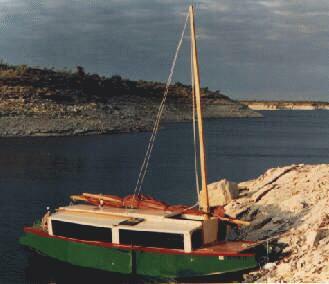 It's easy to draw a V bottomed boat where the water flows smoothly from stem to stern crossing no seams at all. We've found that displacement boats made this way can be quite fast. They say that deep V power boats need a lot more power than the equal jonboat althought the ride will be a lot smoother. I like to combine the shapes a bit with a deep V entry to cut the water and have them blend into a multichine shape aft with a small flat center plank in the manner of the old Swampscott dories. 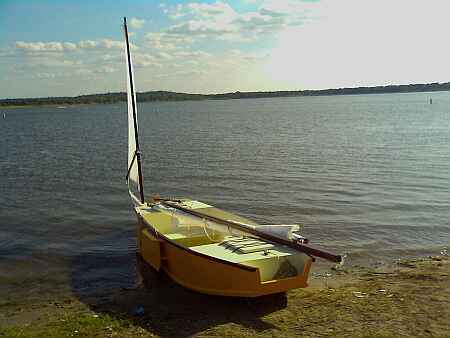 I've never felt the Bolger ski nose boats were the right way to go except in the case of very short wide hulls. I was always taught to abhor those inward 90 degree angles between bottom and the sides of the ski nose. And if you fair those angles with a plate you end up with a multichine hull. The grand idea is to try to visualize how the water is reacting to the hull plates as it flows along and to smooth its path.